After the first responders have extinguished the flames and you know that everyone is safe, you’re faced with the aftermath. Upset tenants and concerns about your property’s structural integrity haunt your mind. Our advice is straightforward – contact an established restoration company that specializes in multi-unit fire damage. As part of our disaster restoration services, we offer complete multi-family fire damage restoration to landlords and property managers across Chicago and the suburbs. We operate headquarters in both Chicago and Skokie, so we’re positioned to respond to your call immediately. You have our guarantee of arrival on the scene in 90 minutes or less. Once you give us the OK, we get right to work. Whether you’re dealing with a fire-damaged apartment complex, condo, or high-rise, we customize our process to keep tenants happy. When possible, we tailor our work and arrange our scheduling so that your tenants can remain in the building during the restoration project. Because we maintain Quality Restoration Vendor status with local and national insurance companies, we’re positioned to effectively guide you through the claims process. This lets you focus on your tenants and your property while we take care of the paperwork. How Does Multi Family Fire Restoration Work? We arrive at your building ready to tackle the job with specialized equipment and protective gear. In the case of limited damages, we work directly with your tenants, recover personal belongings and accommodate individual schedules. If your building suffered an extensive fire, we focus on restoring your property to its original condition as soon as possible. You can depend on us to treat your tenants and your building with the highest levels of professional care. We really are the best in the business. Whether you’re dealing with a kitchen fire or extensive property damage, you can count on us for complete house fire damage repair. We take on every job regardless of size. We know how devastating a home fire can be, so you can rely on our hard work to make everything right again and get you back on your feet as quickly as possible. When fire and smoke damage your business, you need a professional company with the ability to scale. We know that every hour we spend on repairs represents an hour of lost revenue and productivity for your business. You can trust us to stay on the job around the clock. Because our experience covers business parks, warehouses, high rises, hospitals and more, we understand that your situation is unique. We’ve established a solid reputation with local business owners and facility managers, and we’re always happy to provide references. A fire leaves dark stains, oily soot and lingering odors throughout your property, and it contaminates everything. When you face smoke damage, you have us on your side. We specialize in this type of work with years of industry experience all across Chicago and the suburbs. Our certified technicians use the latest equipment and techniques to restore your property, furnishings and personal belongings. When fire strikes the heart of your home, the damage is rarely confined to just the one room. The aftermath of a kitchen fire is different from other types of home fires. Flames melt plastics and synthetics producing an oily smoke that spreads an unpleasant odor throughout the house. Our fire restoration experts have years of experience in kitchen fire restorations. We also help you reclaim important peace of mind. As a landlord or property manager, your heart skips a beat when your apartments or condos are struck by fire. Tenants’ personal safety is at the top of your list, and you also have to address damages that threaten your building’s structural integrity. For many years, we’ve taken care of multi-family properties across Chicago and the suburbs with certified fire damage restoration services. We’re proud of our outstanding reputation, and we’re happy to share references. HOW DO WE REPAIR YOUR WATER DAMAGE? Water damage results in serious problems that need to be addressed right away. Without immediate cleanup, it causes structural damage, ruins furnishings, creates electrical hazards and sets the stage for unhealthy mold growth. 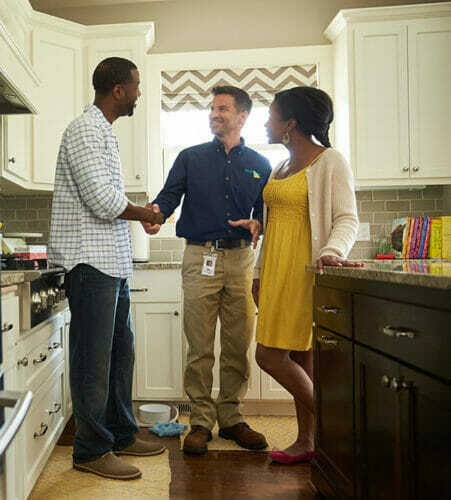 When the worst happens, you want ServiceMaster Restoration by Zaba on the scene. We answer your first call and respond with the industry-certified expertise it takes to get your property back to normal as quickly as possible. We then dispatch our teams of highly trained, certified water damage repair technicians who arrive on the scene in our fully equipped fleet vans. We perform a complete property inspection, asses all damage, and develop an action plan. We explain everything to you including our cost estimate. We do more than clean up all water damage. We restore your property to its original condition. For a detailed overview, please visit our process page. What steps are involved in your fire restoration work? For details about our operations and techniques, please visit our fire damage process page. How do you address fire-damaged furnishings and belongings? Our IICRC-certified technicians use a wide range of industry-proven fire damage cleanup techniques that include special care for personal belongings. You can find more information at our cleanup page. How much do your multi-family fire restoration services cost? Every situation is different, so we can’t give you figures without an on-site inspection. However, we provide a general overview of expenses on our this page. What kind of equipment and tools do you use? We tackle every project with state-of-the-art equipment and the very latest technology. Learn more about our restoration arsenal at our fire restoration equipment page.